Cold Coast siege man dressed as American IndianA GOLD Coast man who allegedly threatened to shoot neighbours with a nail gun was dressed as an American Indian--complete with war paint--during a siege. Police allege the man, who had held them at bay for almost 24 hours, was wearing an Indian head dress and war paint when he surrendered today, and was shouting war-cries prior to his arrest.Comment: What can we conclude from this incident? 1) Indians are universal symbols of protest--mainly against government authority. Examples range from the Boston Tea Party to Palestinians Dress Like Faux Indians to Protest Israeli Oppression. 2) Indians are universal symbols of violence. People who dress as Indians usually do something aggressive: dumping tea, chucking spears, waving tomahawks, or threatening neighbors with a nail gun. They accompany their actions with war paint and war cries. The Palestinian protest above was a rare exception. 3) Plains chiefs are the universal symbols of Indians. Few protesters dress as a Cahuilla or Ute or Shawnee or Wampanoag Indian. If you want to get your message across, use the stereotype of the powerful chief from the past. Show the world that you too can be a legendary figure that no longer exists. So the entire world is aware of the stereotypical Indian portrayed in countless movies, sports logos, and product labels. Yet Kenn and Ken think eliminating mascots, which this man mimicked, is a problem? Yeah, it would be so tragic if Australians couldn't dress up like Chief Illiniwek or Chief Wahoo for their angry protests. They might have to crack open a book to find out what real Indians look like. For more on the subject, see The Political Uses of Stereotyping. 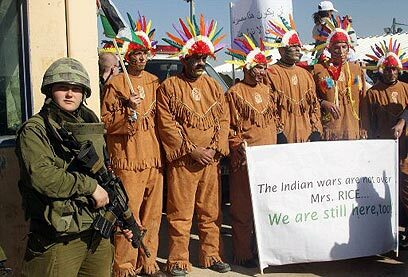 Below: Palestinians emulate Indians by dressing up as party clowns. As for "Palestinians Dress Like Faux Indians to Protest Israeli Oppression", the Palestinians forced the Israelis to institute these roadblocks and the searches and slowdowns through such incidents as the Palestinian government using ambulances secretly as troop transports. With the Palestinian government violating any concepts of decency and respect for civilians or the importance of unhindered medical transport, the roadblocks and inspections are a very reasonable reaction and precaution. Hardly "oppression", and the roadblocks would go away if the Palestinian government did not use the roads as part of its invasion of Israel and its oft-stated goal of exterminating Jews. Palestinians have forced Israel to oppress them? Did they also force Israel to occupy Palestinian territory illegally in violation of UN resolutions 242 and 338? The so-called invasion of Israel would go away if Israel stopped building illegal settlements in Palestinian territory, withdrew from the illegally held territory, and seriously negotiated a two-state solution in good faith. The so-called Palestinians (not even called such until 1967) could not force Israel to do something she's not doing. Israel is illegally occupying NOTHING, & in violation of NOTHING. Trying to keep a lid on daily rocket bombings is NOT oppression. You have got to stop reading propaganda (did you know they consider Jerusalem & Tel Aviv "illegal settlements", too? Did you know that Israel provides the BULK of water, electricity, food & medical services to the so-called Palestinians?) just because they SAY they are like Native Americans - they are nothing of the kind. Israel is the only one who has ever upheld any end of any bargain ever signed by the so-called Palestinians. Read Oslo, read the Road Map - & read Wye, if you want to understand just how LITTLE they want their "own state": they were offered 93% of everything they asked for, & equivalences for everything else - & Arafat turned it down. You ask yourself "why?" It just may have something to do with the 900 MILLION dollars his widow has in her bank account, gotten straight from US & EU handouts. Although I cringed as soon as I saw it no-one else 'appeared' to mind. I credit her for making a speech notifying everyone of a new highway development threatening a sacred site in northern NSW. She finished the concert by stating "remember you are never alone when you are standing up for your people or your planet!" "You guys actually exist still?" NYT: Poem on "justly exterminated race"